My friend PB left us a semi-working telescope when he left town. This is a Meade 285, which is basically a non-fancy telescope dating from the 90s. It has an objective with a 900mm focal length and with an f/15 aperture. You can vary the eye-piece. After taking apart the telescope to make sure the optics were all ok, we fixed a bunch of mechanical issues. I learned that Teflon tape can work wonders with broken screw threads and should be added to duct tape as a useful thing to have in your toolbox (Thanks to AJ for that knowledge). On the left is a picture of the telescope, newly resurrected. We couldn't see the moon yet (because it was just recently a new moon and caused an eclipse), but we did see one of the phases of Venus. It was a crescent, and Venus is heading towards its "new moon" as well because it will soon transit the Sun, for the last time in about a 100 years. Unfortunately, we didn't take a picture of the Venus phase, so a wikipedia picture will do for now. 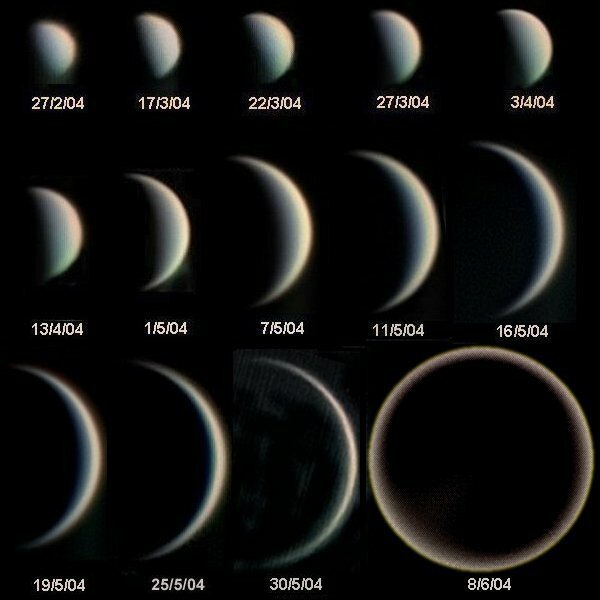 We basically saw a phase similar to the last crescent image in the second row.